Away With You is much less overtly “jazzy” than, say, Saturn Sings from six years prior. 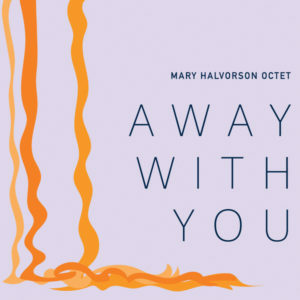 Halvorson seems much like the rightful heir to the kind of music her former teacher Anthony Braxton has been making for half a century. These recordings feature an octet with a horn section playing charts set against abstract solos. The charts aren’t exactly conventional, but they do provide an organized reference point that contrasts with other aspects of the proceedings. In Halvorson’s hands, it isn’t that she merely juxtaposes the strange and conventional, or that she fully integrates them either, but rather she plays those distinct approaches off each other in varying degrees. This lends a dynamism to what she does that seems the key to the album’s success. There is a totality evoked that contains disparate approaches and their synthesis, while extending equal respect to each and all of them. This is how Away With You achieves the much talked about but rarely delivered notion of music that is “inside” and “outside” at the same time.